On Sunday, August 17, 2008, Rev. Tony Ponticello addressed the congregation at the Community Miracles Center in San Francisco, California. The Sunday Service took place right in the middle of the Beijing Olympics. What follows is a lightly edited transcription of that lecture. I want to start out with a quotation from A Course In Miracles, “Thoughts increase by being given away. The more who believe in them, the stronger they become.” (Tx.Or.Ed.5.8) This is a very important idea in ACIM. It is why we join here on Sunday. It’s why we share miracle thoughts with others. It’s why we share thoughts of peace, because they are strengthened when more people believe in them. I believe, right now in the world, more and more people are sharing the idea that countries can come together, set aside their differences, and join for a purpose of peace and celebration. To many people’s surprise, it’s the Chinese that are bringing us this incredible lesson of joining, harmony, peace, and being able to set aside differences. It’s because of this incredibly grand Olympics in Beijing, China that is taking place right now. (I remember when we used to call it “Peking.”) The 2008 Olympics continues to be an incredible event. That’s what I am going to talk about today. I want to continue with another quotation from A Course In Miracles. “If you share a physical possession, you do divide its ownership. If you share an idea, however, you do not lessen it. All of it is still yours, although all of it has been given away. Further, if the person to whom you give it accepts it as his, he reinforces it in your mind, and thus increases it. If you can accept the concept that the world is one of ideas, the whole belief in the false association which the ego makes between giving and losing is gone.” (Tx.Or.Ed.5.6) I think this is actually going on. There’s an idea that is being given away, because of this incredible, grand gathering, that we can all join together peaceably and celebrate our humanness. Billions of people are focused on it, thinking about it, sharing this idea – believing it and strengthening it. I do believe we are producing world altering effects – earth shaking miracles – by the joining that is going on in the world right now. This joining is unprecedented on the world stage. This joining is what I think is the metaphysical underpinnings of this excitement in the air. This is why I am very excited about the Olympics happening. I am not a sports fan myself. I don’t have any direct interest in these types of events. However, I do have an interest in joining. I definitely notice when separation seems to be ending and when joining is happening. I’ve noticed this happening now. The Olympic games have a very interesting history and I want to talk about this history for awhile. In 1980, for the Moscow games, there was no China participating. There was no United States of America participating in those games either, because Russia, more correctly the USSR, had just recently invaded Afghanistan. President Jimmy Carter made the decision to boycott the Moscow games because of this invasion of Afghanistan. Many other countries and world leaders did the same, including China. They still had the games, but the grand joining that these games can represent was marred by this. The Olympic games, as we know them, began in 1896 with the revival of the modern international Olympics. The games in 1896 took place in Athens, Greece. There were 14 nations participating in those games with 241 athletes. We think of that as quite small by today’s standards but for that time it was still the largest, international sporting event to ever happen. The organizers were very excited by the success of this first Olympics. In 2004, in Athens again, for the XXVIII Olympic Games, 202 countries sent delegations to those games with a total of 11,110 athletes which was a record. That’s slightly more than the number of athletes that are currently in Beijing. However, this year in Beijing, for the XXIX Olympic Games, there are more countries participating than ever before. There are 205 countries coming together, marching together into the fabulous Bird’s Nest stadium, in celebration and in peace with almost 11,000 athletes. Now, one might ask, how do we get 205 countries because the United Nations only has 192 countries? Where do the extra countries come from? The International Olympics Committee (IOC) looks at countries differently than the United Nations. The IOC does not have a strict requirement for political sovereignty in order to define geographical areas as “countries.” Puerto Rico is participating in the Olympics as a separate country even though we know Puerto Rico is part of the United States. I find it interesting that there are other ways of defining countries besides political sovereignty. There are other agencies, like the IOC, defining countries differently and these different definitions gets recognized in this incredible event called the Olympics. The Opening Ceremony for The XXIX Olympic Games in Beijing, China that took place on Friday, August 8 was one the most watched television events in history. That’s a remarkable thing. That was a joining, a sharing of a world experience, on a vast scale. I have read different estimates that stated from two to four billion people watched this opening ceremony. Of course, it helped that the Chinese government practically commanded all it’s citizens to watch the event. Considering there are 1.3 billion people in China, this helped boost the numbers quite a bit. However the Beijing time zone also worked in favor of the event because this grand opening ceremony happened in a part of the world that greets the day earlier than a vast majority of the globe. Other parts of the world were watching the ceremony many hours after it had already taken place and by that time the news of its grandeur and its inspirational spectacle had spread. By the time we were ready to watch the ceremony in the United States of America there were already images and news stories talking about it. People wanted to watch this opening ceremony because they had been told how grand and awesomely spectacular it was. I think all the world was truly blessed by this demonstration of grandeur and abundance. It reminded me of the theme for our conference in 2009, “A Blessing From The Abundance Of Our Grandeur.” That theme is based on a quotation from A Course In Miracles. “From your grandeur you can only bless because your grandeur is your abundance. By blessing you hold it in your minds, protecting it from illusions and keeping yourself in the Mind of God.” (Tx.Or.Ed.X.52) I want to acknowledge the Chinese. They came from a perception of their grandeur, a vast nation of 1.3 billion people, and they blessed us all abundantly with this manifestation of their grandeur with that opening ceremony. It was spectacular! It was, beyond a doubt, the largest, most spectacular, theatrical production ever staged in the history of mankind. It was awesome and of a scale far beyond anything else that has ever been attempted. Here are a few other amazing things associated with the opening ceremony. There was an unprecedented number of heads of state in attendance. They estimate about 80, maybe more, heads of state were at this opening ceremony and that’s never happened before. President George Bush and his wife Laura were there. That was the first time a standing US President has ever attended an opening ceremony in an Olympics that was not held here in the United States of America. Presidents have attended them when the Olympics were held in our own country but this was the first time a USA President ever went to another country to watch an Olympics. That’s a significant thing and it was amazing to watch on television because they kept panning to President Bush in the crowd. It was interesting because we are not used to seeing the President in that kind of setting. They were sitting in something that looked almost like open bleachers, stadium style seating, with other people around. It looked like he was at a football game. He actually looked a little nervous sitting in those open bleachers but I’m sure security was good. There he was! The cameras kept panning around the audience to focus in on other international leaders. The French President Nicolas Sarkozy was there. That was controversial because he had threatened to boycott the event at one point. The Russian Prime Minister Vladimir Putin was there. Japanese Prime Minister Yasuo Fukuda was there. All of these heads of state were there in an unprecedented show of acknowledgment and support for the People’s Republic of China. Beijing had tried very hard to get these leaders there. I have to hand it to them. They succeeded. They got those world leaders in a very impressive show of joining. We can join and we can feel secure about doing it. I’m sure the security concerns for this event were absolutely huge. Let’s talk about the history of the Olympics. The first Olympics, in ancient times, was held in 776 BC, that’s “Before Christ.” It was a competition among the city states of Greece. It was designed, even in that time, to be a way of joining for peaceful purposes, instead of joining on the battlefield for war. Should that even be called “joining?” The city states of Greece: Athens, Sparta, Corinth, Delphi, Mycenae, and others, were frequently warring with each other. This perpetual warring was common in ancient Greek times. Somehow they came up with the idea of a different joining with each other, to compete in a way that wasn’t warring. The winners were presented with omir wreaths. The omir branch was an ancient symbol of peace. The omir branch is still associated with peace and is still associated with the Olympics. The young athletes were mostly men, but not exclusively. If the weather was good, they were indeed naked when they competed outdoors. They were also rubbed with omir oil so that they would glisten in the sun as they performed these athletic contests. This goes to show that the Greeks were savvy on putting on a good show. Some women actually did compete in these early games. There were women who were riding horses. I have read that a few daughters of high level politicians of the city states were allowed to compete in certain events. There was a strong religious importance in these early games. They had animal sacrifices in between some of the events. They had ceremonies honoring Zeus and other Greek, Pagan Gods. They were held, like our current games are, every four years. The period of time in between the games was called an Olympiad. It became a unit that the Greeks used to measure time. They would measure years passing in Olympiads. These ancient games went on for many hundreds of years. They gained great prominence in the 6th and 5th century B.C. They gradually started to decline in prominence after the Romans gained power and took over that area of the world. When Christianity was officially declared the state religion of the Roman Empire by Emperor Theodosius in the year 393, the Olympics were banned because they were seen as a Pagan rite. They were honoring Zeus and the other ancient Greek and then Roman Gods. It was 1500 years before we had Olympic games again. 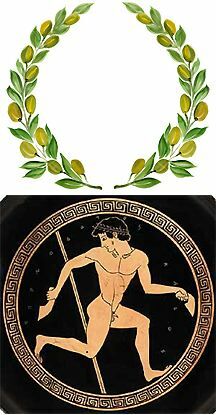 For about 40 to 50 years prior to the current revival of the Olympic Games in 1896, there were smaller, less international, Olympic Games sometimes called “Olympian Games.” Greece was staging some and England was staging some. One was held in the Athens city square in 1859. A wealthy Greek philanthropist paid for a refurbishment of the ancient Panathenian Stadium that then housed Olympian Games in 1870 and again in 1875. Two countries competed, Greece and the Ottoman Empire. These early games were not organized the way the Olympics are now. They were more independent events with far fewer countries participating. In the 1890s a French Baron named Pierre de Coubertin, a high nobleman with resources, was trying to research the reason why the French had lost the Franco Prussian war from 1870 to 1871. He decided that the French lost because French soldiers, and the French youths, were not properly trained in physical education. He also was thinking that there had to be other ways to bring countries together besides uniting against common enemies for war or clashing bloodily on a battle field. There also must be ways other than war to arouse intense national pride and enthusiasm. He started to focus on the idea of Olympic Games. He attended at least one of these earlier Olympian Games that was being held in England. He decided to globalize the idea. He amassed an international group of people at the Sorbonne in Paris, France in 1894 and formally presented this idea of having a true internationally joined Olympics Games. It was decided at this meeting that in two years they would have the first new Olympic Games in Athens. They also officially formed the organization named the International Olympic Committee, the same IOC that exists today. The IOC ran this first Olympic Games in 1896 in Athens. It was held in the, once again refurbished, Panathenian Stadium. The very next Olympics, in 1900 was moved to Paris because the French had been so prominent in starting this new Olympic movement. If you have wondered why every time they announce things at the Olympics, they always announce it in French, it is because France was the country that truly spearheaded this revival of the modern Olympic Games. They are still honored. That’s why it would have been a very big deal if French President Nicolas Sarkozy had gone through with his boycott and not attended the opening ceremony. Hopefully, many of you saw this truly grand event that took place in the newly built Bird’s Nest stadium. If you haven’t seen it, I recommend you find a way to see it. I know people who have recorded it and know that a DVD of it can be purchased. There were 15,000 performers in that opening ceremony, more performers than there were athletes in the games, including 2008 Fou drummers. This is thought to be the world’s most ancient musical instrument and it dates back to the Xia and Shang dynasties that existed between 2070 BC to 1046 BC. These drums are formed of clay and bronze. The drumming performance was spectacular. In between drumming, the 2008 drummers chanted loudly in unison a saying of the Chinese philosopher Confucius, “Friends have come from afar, how happy we are.” We were told by announcers that special training had taken place to make sure that all the drummers smiled more, to truly communicate happiness and welcome to all who watched. A side benefit is Chinese people, the world over, have now been given a greater permission to smile because of this event. There was an unparalleled torch lighting ceremony. During this ceremony the famous Chinese gymnast Ni Ling, simulated running on air while being suspended from cables moving around the whole parameter of the Bird’s Nest stadium. He was about 225 feet above the ground and performed this running on air for a distance of about 2,400 feet around the Bird’s Nest’s top circumference with a gigantic projection screen behind him that was at the very top of the stadium. He is a significant figure because he was the Olympic gymnast who won, 3 gold medals, 2 silver medals, and 1 bronze medal in the 1984 Olympics that was held in Los Angeles. Li Ning is currently 44 years old, not a young man, and he accomplished such a death defying feat, running on air 22 stories above the ground with the eyes of two to four billion people fixated on him. It was awesome. He is especially significant because that Olympics, when he won his many medals, was the first Olympics China had participated in for 32 years. China had taken a long break from the Olympics. When they came back to it he was their big Olympic champion. One flame lighting another flame. This symbolism is very A Course In Miracles attuned. They start the torch journey in Greece where the Olympics started. They carry the torch all around the world. One spark lights the next spark, lighting the next flame. The light of the Olympic cauldron sheds symbolic light over the entire Olympics. This symbolism communicating a metaphysical, spiritual message to countless millions – no, billions of people who will finally watch this – is why I have named his talk, “Earth Shaking Miracles.” In the United States, because of the advance publicity with people knowing it was such a grand ceremony, a record number of USA viewers, estimated at 34.2 million people, watched this event. I have been talking about what a great healing manifestation this is for the world. However, we also have to understand what a great healing this is for China. We don’t usually put ourselves in the mind set of the Chinese. Why was this so significant to China? To begin with, China was not invited to the first few Olympics. It wasn’t until 1932 that they were asked to participate in an Olympics at all. At that time, China was struggling. They were going through great difficulties. They only had the money to send one athlete to this 1932 Olympics. That athlete didn’t make the finals, but at least China was represented. They did participate in the next few Olympics with 1952 being the last one that they would participate in for more than three decades. China got into an isolationist policy where they weren’t going to be involved with the “outside” world. They perceived themselves to be a big country with plenty of natural resources. They thought they could be self contained. They didn’t want to mingle with these other cultures and dilute their proud cultural heritage. For the next 32 years they weren’t involved with the Olympics. They did not participate. They had planned to participate in the 1980 Moscow games, but that was when Russia had invaded Afghanistan. Many countries, including China, boycotted that Olympics. It wasn’t until the 1984 games that China came back to the Olympics, after their 32 year absence. They ended, at least for the Olympics, their isolationists policy. In my mind, this is ending a policy of separation. A Course In Miracles talks a lot about the fallacy of the defense of separation. Nothing can be protected by separation. Somehow China had believed that they could protect themselves, defend themselves, by this policy of isolationism. They participated again in 1984 and that was the year that the gymnast Li Ning, who lit the cauldron this year, won those six medals. That is why he was so significant. He meant so much in the minds of the Chinese people. We may be judgmental and say, “Oh, it’s too bad that China was so isolationist for all those years but it was their own fault.” However, the USA has this in its own history. All throughout the 1800s and the early 1900s, we were very much isolationists. In 1823, we had the Monroe Doctrine. President James Monroe issued it. It stated, “In the wars of the European powers, in matters relating to themselves, we have never taken part, nor does it comport with our policy, so to do.” The United States of American then had the policy, no matter what the European countries did, we wouldn’t get involved. It seemed logical at the time. We were a big country. We have all these natural resources. It didn’t matter what other countries did. We can stick to ourselves and it’s better for us to do so. It wasn’t until World War I that we had any major departure from the Monroe Doctrine. That was only because our boats were being attacked. We did, eventually, participate in World War I. We helped win the war for the Allies. However, after the war we went right back to our isolationist policy. That’s why the United States did not join the League Of Nations when it formed after World War I. Many people believe our absence was critical to the League Of Nations’ failure and to the subsequent events that led to World War II. Our isolationist policy, that we were better off separate and could defend ourselves better that way, has never truly worked for us. If we consider World War II to be the result of this policy, think of how destructive separation and isolationism has been for us and the world. In today’s time, with today’s communication network, isolationism is almost unthinkable. This kind of separation isn’t even conceivable anymore. During the early part of the 1900s, the United States introduced high tariffs on foreign goods, so that they would not compete well with American products. Also, during this time, we drastically limited immigration. We were trying to keep people out. We would be better separate. Before we get too critical of the Chinese for their isolationism we need to realize we have done the very same thing ourselves with devastating world consequences. Some spiritual people think the Olympics, with all the focus on athletics, is too much about body identification and competition to truly serve a spiritual purpose. They believe this body competition to be a dark and devious, separation symbol. Wasn’t the body manifested to prove separation? How many in the world can have bodies like those athletes at the Olympics? Who can look like the swimmer Michael Phelps, who has won eight gold medals? What a body that guy has, those arms, that torso, wow! Who’s going to work out like that all the time and how many are going to win eight gold medals? Doesn’t this just increase the separation? Only one wins a race, many others loose and we only celebrate the winner. Should this kind of thing be celebrated? The Olympics makes us common people seem so different from those athletes? I think we have a simple choice. Are we going to view this in a dark and devious separation way, or are we going to see it all as a way of joining? A Course In Miracles tells us everything in the world gives us this option. We can look at everything through egoic eyes or we can look at it with Holy Spirit vision. We can see the joining that is happening or we can see the separation that is happening. What perceptions do we choose to strengthen? Even the language of unique bodies and athletic competitions that may have actually been originally devised to communicate separation to us (I’m stronger than you!) can communicate love to us, if we allow the interpreter of the message to be the Holy Spirit and not the ego. It is the same with everything in the world. Possibly it was manifested by the ego to tell us of separation, but turned over to the Holy Spirit it can communicate love, union, and joy. We just have to give it to the right interpreter. I think we have this choice for the Beijing Olympics. A Course In Miracles tells us, “Learn of His happiness, which is yours. But to accomplish this, all your dark lessons must be brought willingly to truth and joyously laid down by hands open to receive, not closed to take.” (Tx.Or.Ed.14.62) We have to lay down the dark lessons in order to receive the other message. We have to lay down the dark lesson of Tiananmen Square in 1989. We have to lay down the dark lesson of China’s taking over of Tibet. We have to be willing to receive another message from China and they are giving us another message. What’s our choice, to hold on to dark lessons from the past or embrace this new message of the present? The opening ceremony was not only grand, it also had beautiful spiritual imagery and messages. It was all about communication. There was the huge, high tech scroll celebrating that the Chinese had actually invented the written word. There was an amazing performance celebrating that it was the Chinese that had invented moveable, woodblock type. There were people inside gigantic woodblocks that went up and down creating Chinese characters and especially the character “he” that means “harmony” or “peace.” Over and over again this Chinese character for harmony and peace kept being created during this woodblock performance. I loved how, when it was over, the human performers inside the woodblocks who previously hadn’t been seen, popped their heads out and waved and smiled to the audience. This was a great surprise because the precision of the movements of the blocks had made it seem that it must have been computer controlled. No, it was 897 human performers that had taken 10 months to rehearse and master this impressive performance. The Chinese made a gigantic effort to communicate a global message of harmony and peace. Did we hear it? The Chinese organizers chose the theme for the Beijing Olympics, “One World, One Dream.” This theme sounds like it’s right out of A Course In Miracles. This theme, “One World, One Dream” was the overlying theme for the opening ceremony as well. This was intertwined with the theme of harmony and peace. Billions of people watched this. It was, no doubt, the grandest theatrical presentation in the history of mankind – communicating in so many ways and communicating to so many people. Remember the quotation form the start of this lecture, “Thoughts increase by being given away. The more who believe in them, the stronger they become.” (Tx.Or.Ed.5.8) How many more people now believe that we all can join together in peace and celebrate our grandeur because of what the Chinese have given us. My hat goes off to the Chinese. They have produced a history making, grand spectacle. They have produced an earth shaking miracle. Following is the speech given by International Olympic Committee President Jacques Rogge at the opening ceremony of the Beijing Olympics, August 8, 2008. “Mr. President of the People’s Republic of China, Mr. Liu Qi, Members of the Organizing Committee, dear Chinese friends, dear athletes: For a long time, China has dreamed of opening its doors and inviting the world’s athletes to Beijing for the Olympic Games. Tonight that dream comes true. Congratulations, Beijing. “You have chosen as the theme of these Games ‘One World, One Dream.’ That is what we are tonight. As one world, we grieved with you over the tragic earthquake in Sichuan Province. We were moved by the great courage and solidarity of the Chinese people. As one dream, may these Olympic Games bring you joy, hope and pride. “Athletes, the Games were created for you by our founder, Pierre de Coubertin. These Games belong to you. Let them be the athletes’ Games. Remember that you are role models for the youths of the world. Reject doping and cheating. Make us proud of your achievements and your conduct. “As we bring the Olympic dream to life, our warm thanks go to the Beijing Organizing Committee for its tireless work. Our special thanks also go to the thousands of gracious volunteers, without whom none of this would be possible. Beijing, you are a host to the present and a gateway to the future. Thank you. This article appeared in the July 2008 (Vol. 22 No.5) issue of Miracles Monthly . Miracles Monthly is published by Community Miracles Center in San Francisco, CA. CMC is supported solely by people just like you who: become CMC Supporting Members, Give Donations and Purchase Books and Products through us.